Without going into details about The Lab's plans for new communities aimed at premium accounts (Web), let me tell you about the freebies I found in one of them: Elderglen (SLurl). This pic shows my pixy alt hammering away to make a horseshoe, one of a couple items you can get FREE just for using the animated activity. Alternately, you might be given a sword when you stand up. 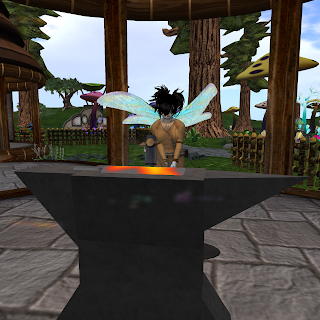 Elsewhere in the telehub Welcome Area, head to the Apothecary to grab a Fairy Collection Jar. Wear it and wander around outside to chase fairies. When you get one, a cute anim plays, a fairy appears in the jar, and you are given a pair of wings. Several styles are available, at least seven by my count. All around the sim inside the various buildings you can grab other freebies like spellbooks, staffs, musical instruments, crystals, bowls, candles, various foods, and more. Exploring is a lot of fun, even the outhouses.